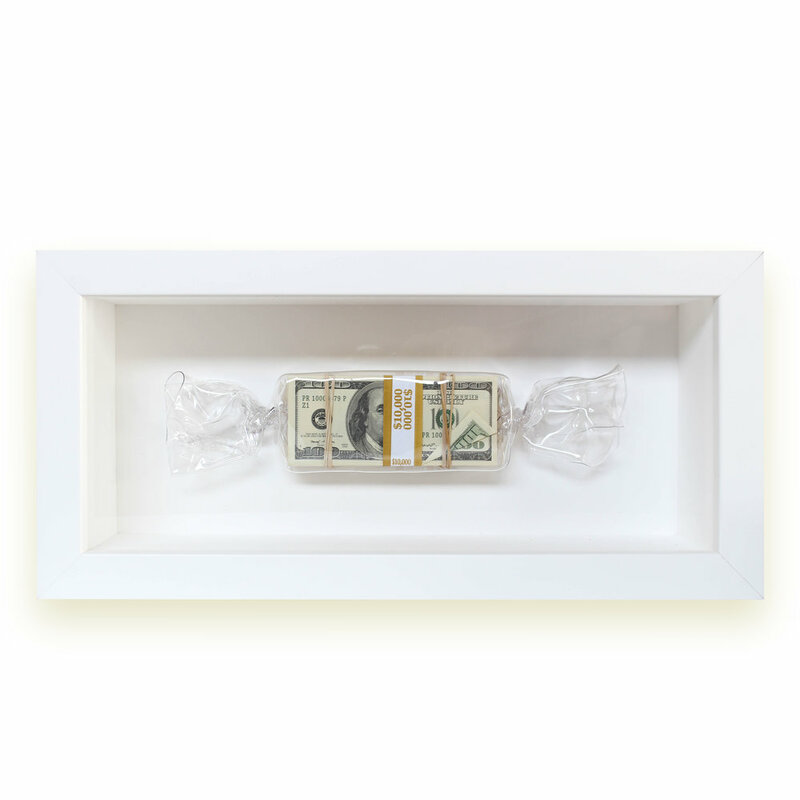 If you were to stumble upon the private art collection of Wiz Khalifa, Aaron Paul, or Ashton Kutcher, you’d spot art created by Daniel Allen Cohen. Cohen is a multi faceted artist from Los Angeles, California with a flair for commentating on societal issues in unique ways. Often exploring different mediums, Cohen’s projects adapt and evolve with his current focus. Whether he targets addiction, drugs, wealth, or fame, his work is rooted in central themes that urge to be interacted with. Cohen’s concise approach to art creation leads to a lifelike final product that often details vices, or the effects of such. The elegance of his work lies in the subtle details inside the frame, or boldly printed on a life size candy bar or sculpture. Depending on the viewer’s interpretation, the spirited commentary will spark some type of conversation, regardless of your standpoint. Cohen’s work is meant to be interacted with and explored down to its core. His witty take on drugs and addiction has turned many heads in the art world. On social media, Cohen appropriately goes by This Is Addictive (@ThisIsAddictive). Though it is not always about drugs or vices, his commentary hones in on the taboo topics we may sweep under the rug in our daily lives. Everyone has their vices, and This Is Addictive explores that realization through brilliant tongue in cheek commentary. Sometimes his message is as simple as, “Time is money” displayed by a clock flaunting money signs in place of numbers. Whichever the case, it is undeniable that Cohen has created a brand that initiates conversation through interaction. Often artists develop a love for art as a hobby as they grow older, but Cohen was born with the urge to create. After launching his own clothing line and working in an art gallery, he shifted toward promoting his work at major art shows. From there his sales and exposure skyrocketed to new levels through the relationships he made. Cohen humbly boasts a consistent growth in art and sales since 2016. Cohen is always exploring new artistic concepts, but he is very particular with his projects. In today’s art world, it is common for an artist to push out hundreds of projects in order to expose their brand to the fullest. Cohen lives by the notion that quality over quantity will lead to more impactful work. He is always looking to do create something that has never been done before, so takes his time in finding the perfect concept. His addictive brand is not only popular on social media, but it has spoken to celebrities, famous personalities, and art collectors all over the world. Dana White, Stephen Ross, Chris Hollod, Cheech Marin, and The Ross Family (owners of the Miami Dolphins) also own work by Cohen, along with thousands of art enthusiasts in touch with his creative wit. Every year Cohen is growing in both reach and sales, but the craziness of success is well worth it for him. “It’s kind of a roller coaster at this point in the game. It’s a thrill, it’s faced paced, it has its highs and its lows, its peaks and its swirls, but I find myself with all that love and all the craziness, it’s all worth it compared to working a 9 - 5 job. Keeping the dream alive and having a playful heart is definitely my driving force. Cohen was invited to the critically acclaimed art fair SCOPE Miami Beach in 2016 after being noticed at various shows and Art Basel. It was here where Cohen blossomed on the big stage; not only being accepted, but as the best selling artist at the show. Riding high on his success at SCOPE Miami Beach, Cohen realized that he could push even harder. “That led me to put out everything I had in me in the following year to come back and bring it even bigger. I was back to back best selling artist at the gallery,” he said. Art fairs like SCOPE or Art Basel, gallery exhibitions, and group or solo shows are very important for emerging artists to grow their audience and sales. They provide an intimate experience for local or traveling enthusiasts to enjoy and familiarize themselves with an artist. It is an excellent outlet for artists to release special projects or interact with fans. “In his 2017 series, Periodic Table of Drugs, Cohen addresses this shift and reconstructs the paradigm of elements he sees as possessing value in today’s society: drugs. Using the same grid format of the original table, Cohen parodies the display of elements such as lithium, carbon and magnesium by replacing them with various recreational drugs like LSD, cocaine and marijuana,” (Professor Lizy Dastin). “In his series, Precious Bars, Cohen hybridizes these cross-generational desires and presents over-sized objects of nostalgia, lust and yearning. To do this, he parodies packaging of iconic chocolate bars that promise sugary treats, slightly altering their text to seduce with promise of wealth instead,” (Professor Lizy Dastin). Cohen has made a major impact on the art industry in just a few short years, and he will continue to grow as he builds his creative brand. Each project contains a unique element that sets him apart from the rest of the pack with his witty take on social commentary and discussion, and viewers look forward to the interpretation involved. This Is Addictive fans can look forward to a very special project currently in the works; something very sentimental and personal to both him and his family. More details will come soon, but Cohen was very excited to focus on a project that explores his family’s alluring history. Cohen’s desire to create thought provoking art is at the forefront of his body of work, and he is rewarded through the unique reactions of his viewers. Creating a dialogue about taboo topics is important in order to initiate some type of change, and Cohen’s work is coiled together with messages that do exactly that. Check out more of Daniel Allen Cohen’s work @thisisaddictive on Instagram or on his website.